Physical Description Patok is a very large, blue-skinned humanoid. He has a pale orange stripe that runs down the middle of his face and neck, and several other shorter stripes that cross over the top of his head. His ears are large and curve out to a point, and he has two sets of spikes that begin at either side of his brow and span over his head to the back of his neck. From his lower brow to the crown of his forehead, he has a set of ridges similar to those of a Klingon, but they are much less defined. He has a square jaw, a rounded chin, and a thin nose, with hardly any sign of nostrils. His shoulders are broad and muscular, as is most of his upper body. Like most of the Nogron people, he is as strong as an ox, but primarily gentle and diplomatic in nature. Other Family The Nogron people are taken from their family unit at a young age to train for their lifelong assignment. They have faint memory of their immediate family and no connections with extended family. General Overview The Nogron are a very emotional people, but their methods of expressing emotion differs greatly from most “outworld” species. They use a form of telepathy that is rarely compatible with other creatures. It doesn’t allow them to communicate actual thoughts, but is the sole method that they use for communicating emotion. Because of this, Patok appears to most people to be as stoic as a Vulcan. His speech is overly mechanical with little to no expression to accompany it. He has a strong drive for discovery and exploration, and is fascinated by “outworld” cultures. Strengths & Weaknesses As his size would suggest, Patok is very strong, but he is timid when it comes to physical conflict . He is also timid with a phaser, and average at best when it comes to operating one. Even when he attempts to be casual, his speech sounds rigid and formal. He has a difficult time understanding the nuances of language and the variety of physical gestures that most species make when they talk. He is more diligent than most to his duties and focuses heavily on the task at hand. Once he has been assigned to a task, it is very difficult to distract him from it. Ambitions Even after 9 years away from home, Patok still feels like a stranger in a far away land. His ultimate ambition is to find his home world and reconnect with his people. Beyond this, he is hooked by the fascination of exploring new systems and learning everything he can about other civilizations, current or ancient. Hobbies & Interests Despite his expressionless demeanor, Patok is very curious, and loves to try new things. He is mostly interested in collecting “outworld” artifacts, but also loves to play games with other crew members. Family The Nogron place no importance on family connections. They are a very relational people, but are more committed to duty than anything else. Because of this, Nogron children are placed in training for their lifelong assignment when they are young. It is rare for a Nogron to build relationships outside of his assignment, as this is where he will spend almost all of his time. Relationships Taidere Kasul - A Nogron female who was assigned to the 23rd alloy research facility, and worked beside Patok for most of her life. Before the extraction incident, Patok had intended to pair with her. Friendships Hyson Delvet - Patok's closest friend, also assigned to the 23rd alloy research facility. His assignment varied from Patok's, in that he specialized in machine maintenance, but they both worked in the same facility. 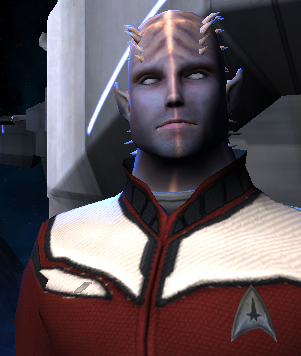 Gafnan Krutesk - Survived the extraction incident with Patok, and studied with him at Starfleet Academy. Personal History Patok was removed from his family unit at age 6. For the Nogron people, this is usually a very emotional, but also exciting time, as it is when they take on their true identity. He was taken to the Loloth 23rd Alloy Research Facility to be trained for his assignment. For the rest of his cycle, he would assist in studying the qualities and potential uses for various alloys. For 19 years, that is precisely what he had done, and he had built many relationships over those years. At age 25, Patok was sent on an experimental study to explore a rogue asteroid near Loloth. Several representatives from different assignments were placed on the mission for their expertise. It was hoped that they would be able to extract undiscovered materials from the asteroid and bring them back for evaluation. They would also need to determine the point of origin of this asteroid. If their efforts led to the discovery of a useful resource, the Nogron would certainly want to locate more deposits. When they arrived at the asteroid, they discovered that it was actually a vessel that had been disguised using some form of visual distortion. The vessel used many forms of highly advanced technology. The crew of the vessel were members of the Ugronian species, and had come to monitor activity on the surface of Loloth. They captured the Nogron explorers out of fear that their covert research would be compromised. It would be impossible to allow them to return home and trust that they would be able to keep the secret. In panic, the Ugronians used an advanced transportation device to send the Nogron and their small ship to a remote location. The Nogron would have to find a way to survive on their own, or integrate into another society. For the first year, they were able to find a suitable moon where they built several shelters and foraged for food. Unfortunately, they were not familiar with the local fruits, and several of them died from poisoning. Only Patok and one other, Gafnan, had survived. They were recovered by the crew of the USS Herald, a Nova class starship, and served as auxiliary crew for the year that it would take the vessel to return to earth. Patok enrolled in Starfleet Academy and graduated 6 years later with a double major in Engineering and Astrophysics with some emphasis in Xenoarchaeology. His first assignment was as an engineering officer aboard the USS Adamant, a Nebula class ship, where he had served for 2 years before his next transfer. Pre-Starfleet Career (If applicable) Patok served his assignment with the Loloth 23rd Alloy Research Facility from age 6 - 25. He specialized in the study of alloy properties. Starfleet Academy Due to the trained diligence of the Nogron people, Patok excelled in his studies. It was rare to see him peel away from his books, and he had high marks in all of his classes. He remained at the academy for 6 years to complete his double major in Engineering and Astrophysics, taking elective classes in Xenoarchaeology to quench his thirst for “outworld” cultures. Early Career Patok spent his first year of service as an unofficial operations officer aboard the USS Herald. The ship was shorthanded due to a run in with an aggressive cardassian ship that had killed several of the crew. He served alongside his fellow Nogron, Gafnan, who acted as a security officer. The two spent much of their spare time together, as it was difficult to communicate with the rest of the crew. 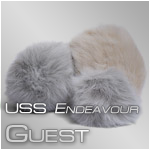 USS Endeavour Due to his interests and exploits in Xenoarchaeology, Patok was recommended to join the crew of the USS Endeavor to assist with their mission aboard the abandoned station, Deep Space 19.